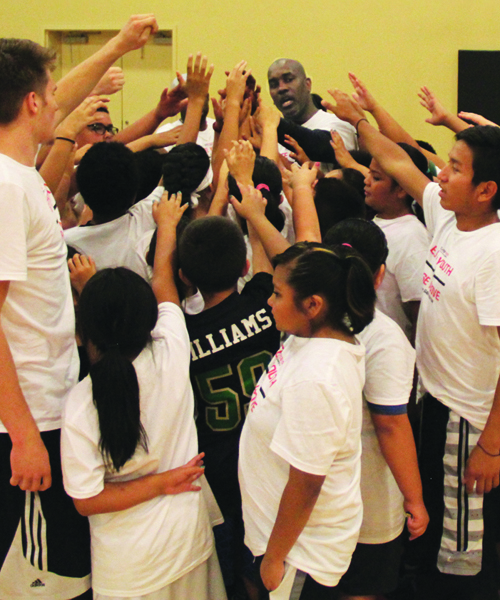 Gary Payton with Native youth during basketball camp. 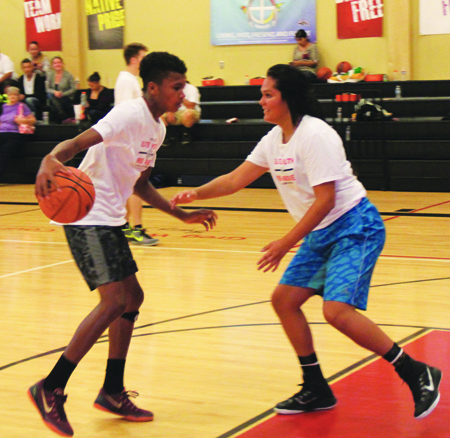 RISE ABOVE was founded by Jaci McCormack, an enrolled member of the Nez Perce Tribe, to empower Native youth to live a healthy lifestyle and provide awareness, prevention and character enrichment using the sport of basketball as a platform. The purpose is to connect with the urban Native youth on a level that they can relate to and understand in order to create a lasting impact on their lives. Elite Youth Camps organizes camps, clinics, tournaments and non-profit community events for professional athletes and their respective teams. 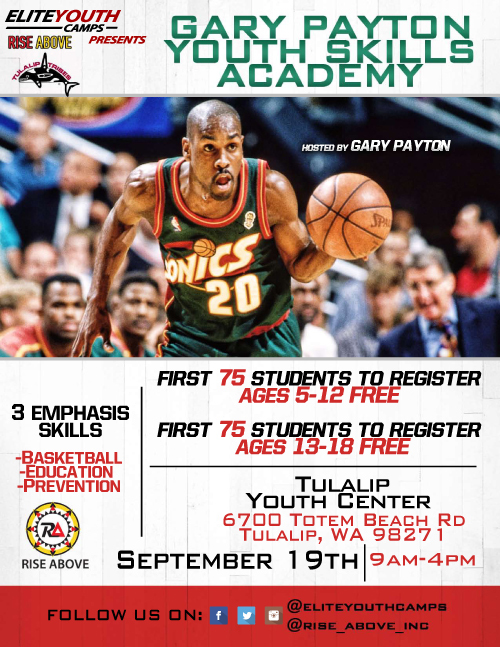 In our case the professional athlete was Hall of Famer Gary Payton and his team of 100+ Tulalip youth who were registered for basketball camp. With the assistance of Payton, Elite Youth Camps taught our youth the importance of hard work, teamwork, discipline and self-respect. 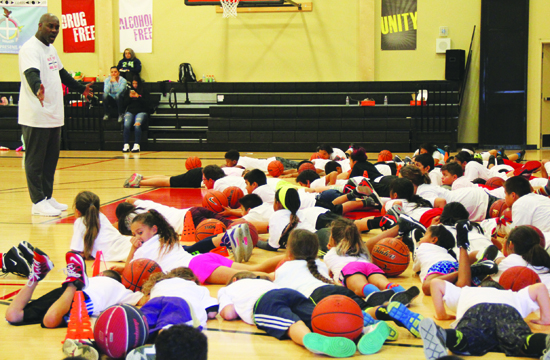 Their focus was to provide the young Tulalip athletes of all skill levels with the instructions and training that have made some of the NBA’s brightest stars elite on and off the court. Coach Dave uses his immense background in basketball, as well as his relationships with professional athletes to plan and execute the best camps around. He graduated from Rainier Beach High School in Seattle before playing college ball at the University of Washington. When his playing career concluded he decided to combine his love for basketball and his passion for helping the youth and made Elite Youth Camps a reality. As an urban youth just wanting to play basketball, Coach Dave remembers attending Gary Payton’s youth basketball camp as a child and the lasting effect Payton’s camp left with him. Though Coach Dave primarily leads the basketball drills with help from his assistance coaches, “The Glove” is ever-present with campers who get plenty of opportunities for autographs and pictures with the nine-time NBA All-Star. 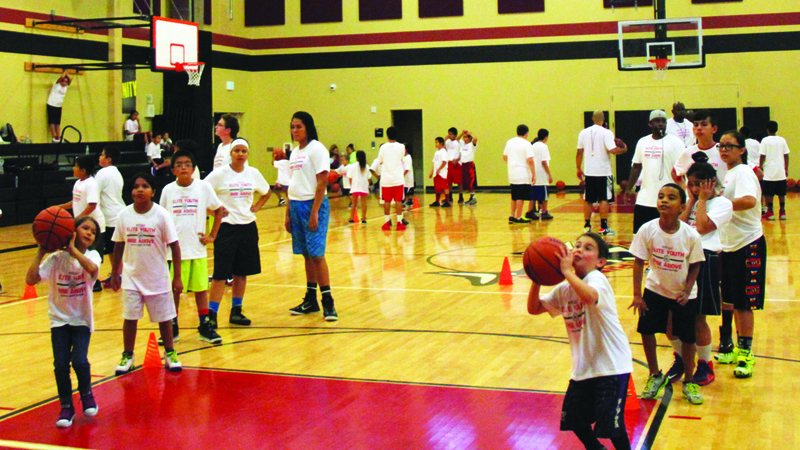 The camp started at 9:00 a.m. Saturday morning and continued until 4:00 p.m. The camp was broken up into two 3-hour sessions. The early session was all about basic basketball fundamentals and technique on the individual level, while the afternoon session focused on group drills emphasizing sportsmanship and teamwork. In between sessions the 100 or so Tulalip campers had a 1-hour break to enjoy their catered lunch provided by Youth Services. During the lunch hour, camp coaches and volunteers were able to explain and pass-out a wellness survey to the kids. The survey, consisting of questions regarding drugs, alcohol, bullying and self-awareness, will be used as a barometer to get a general feel for the wellness of the Tulalip youth. Results of the surveys will be compiled and processed by RISE ABOVE before being passed on to our own Youth Services department. Also, during the lunch break it came to the attention of the syəcəb that there was a handful of Native youth who made quite a journey to Tulalip to participate in the camp and meet Gary Payton. A family with three eager young basketball players came from the Confederated Tribe of the Colville Reservation, while another family, the Vanderburgs, journeyed all the way from the Confederated Salish & Kootenai Tribes (CSKT) of the Flathead Reservation, located in northwest Montana. The Vanderburgs held a frybread and chili dog fundraiser at their local community center in order to pay for their kids’ entry fees and travel expenses for the Tulalip basketball camp. Concluding the camp, each coach shared heart felt words with the kids and thanked them all for allowing the coaches the opportunity to work with them. The last to speak was the icon Mr. Gary Payton. Upcoming native youth basketball skills academy in partnership with Rise Above & Elite Youth Camps, Saturday September 19th 2015 from 9am-4pm located at the Tulalip Youth Center. Ages 5-18, must be a Tulalip Tribal member. Pre-registration is suggested, stop by the Don Hatch Youth Center.